For additional resources, sample letters to public spaces/schools, and actions to help eliminate quats from products and public spaces, CLICK HERE! Ammonium quaternary compounds (“quats”) are found in household cleaning products like disinfectant sprays, disinfectant wipes and toilet cleaners. Quats are registered as pesticides with the EPA, meaning you will frequently find them listed as “active ingredients” on the front label of disinfectant products. 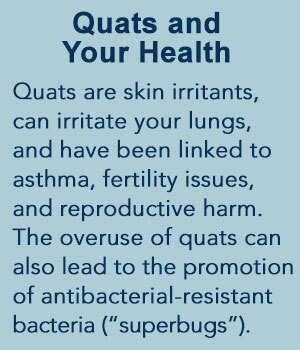 Quats are powerful irritants. Skin exposure to quats can lead to dermatitis (skin rashes), and exposure through breathing can irritate the lungs. The links between respiratory conditions and quats are of particular concern. Studies of farmers who regularly used disinfectants containing certain quats showed that such exposure led to higher rates of chronic respiratory conditions and decreased lung function. In two studies, quats have been specifically identified as inducers of occupational asthma in cleaning workers. Certain quats have also been identified as triggering new cases of work-related asthma (asthma caused by work) as well as cases of work-aggravated asthma (work conditions worsen pre-existing asthma). Laboratory studies have shown that quat exposure in mice leads to greater immune reactions to allergens. While the mechanism that leads to asthma is not fully understood, there is concern that quats may play a role in causing the immune system to overreact to allergens, potentially worsening asthma symptoms. Recent research also points to concerns about quat exposure on reproductive health. A study on mice found that when a disinfectant containing quats was used to clean out the cages of mice, the fertility of the mice declined significantly, and birth defects in those mice that were born increased. Due to the persistence of the chemicals, it took several months after switching to a different type of cage cleaner to get rid of the residue of the quats on the cages. Followup research also linked exposure to quats to specific adverse reproductive effects in both male and female mice. Male mice exposed to quats had lower sperm concentrations and decreased sperm motility. Female mice exposed to quats had significantly decreased fertility and disrupted ovulation. A third reproductive study found increased rates of neural tube defects in the offspring of mice exposed to quats. The widespread use of quats is of concern as they enter our environment. In recent years, detection of microbes that are resistant to quats are becoming increasingly more common. There is increasing concern over the potential ineffectiveness of quats to disinfect in the livestock industry particularly due to quat resistance. In addition, microbes that are resistant to quats have been shown commonly to be resistant to other antibiotics as well, compounding the global problem of antimicrobial resistance. How do you know a quat when you see one on a label? 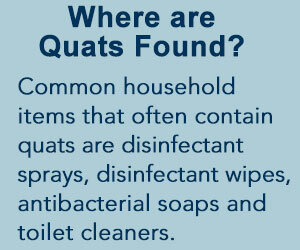 Why are quats still allowed in household products? Similar to triclosan, quats are antimicrobial compounds, designed ideally to eliminate harmful microbes from surfaces in your home. However, the effectiveness of using antibacterial cleaners, such as those containing quats, to actually reduce illness in the home has never been proven. Recently, the Food and Drug Administration considered banning two common quats, benzakonium chloride and benzethonium chloride, from consumer and healthcare hand and body washes, due to a lack of available data to assure their safety. In response to a request from manufacturers, the FDA granted a deferral of their decision for several years as manufacturers generate the needed studies to demonstrate their safety. The key issues industry is working on, initially, are experiments to help quantify how much of the antibacterial chemical is absorbed through your skin when you wash/rub your hands; and experiments on how effectively products containing these chemicals are actually killing germs of concern on your hands. After this is done, they may tackle the necessary research on carcinogenicity, reproductive harm and endocrine disruption that the FDA also noted were missing from publicly available literature. Basketter, DA (2004) Strong irritants masquerading as skin allergens: the case of benzalkonium chloride. Contact Dermatitis. Vol.50, No. 4: 213-7. April 2004. Preller, L. (1995) Lung function and chronic respiratory symptoms of pig farmers: focus on exposure to endotoxins and ammonia and use of disinfectants. Occupational and Environmental Medicine. Vol. 52: 654-660. (1995). A. Purohit et al. (2000). Quaternary ammonium compounds and occupational asthma. International Archives of Occupational and Environmental Health, August 2000, vol. 73, no. 6:, 423-27. J.A. Bernstein et al. (1994). A combined respiratory and cutaneous hypersensitivity syndrome induced by work exposure to quaternary amines. Journal of Allergy and Clinical Immunology, August 1994, vol. 94, no. 2, Part 1, 257-59. Jajosky, RA et. al. (1999) Surveillance of Work-Related Asthma in Selected U.S. States Using Surveillance Guidelines for State Health Departments – California, Massachusetts, Michigan, and New Jersey, 1993-95. MMWR 1999:48 (No. SS-3) June 25, 1999. Larsen ST et.al. (2004) Adjuvant effect of quaternary ammonium compounds in a murine model. Toxicology Letters. Vol. 151: 389-398. 2004. Hunt, P (2008) Lab disinfectant harms mouse fertility. Nature. Vol. 453: 964. June 2008. Melin VE, Potineni H, Hunt P, Griswold J, Siems B, Werre SR, and Hrubec TC (2014) Exposure to common quaternary ammonium disinfectants decreases fertility in mice. Reproductive Toxicology; 50: 163–170. December 2014. Melin VE, Melin TE, Dessify BJ, Nguyen CT, Shea CS, and Hrubec TC (2016) Quaternary ammonium disinfectants cause subfertility in mice bytargeting both male and female reproductive processes. Reproductive Toxicology; 59: 159–166. December 2016. Hrubec TC, Melin VE, Shea CS, Ferguson EE, Garofola C, Repine CM, Chapman TW, Patel HR, Razvi RM, Sugrue JE, Potineni H, Magnin-Bissel G, and Hunt PA (2017) Ambient and Dosed Exposure to Quaternary Ammonium Disinfectants Causes Neural Tube Defects in Rodents. Birth Defects Research 109:1166–1178, 2017. Zou L, Meng J, McDermott PF, Wang F, Yang Q, Cao G, Hoffmann M, Zhao S. (2014) Presence of disinfectant resistance genes in Escherichia coli isolated from retail meats in the USA. Journal of Antimicrobial Chemotherapy. 69(10):2644-9. October 2014. Sundheim G, Langsrud S, Heir E, and Holck AL (1998) Bacterial resistance to disinfectants containing quaternary ammonium compounds. Holck International Biodeterioration & Biodegradation. Volume 41, Issues 3–4, pp: 235-239. 1998. Duran N, Temiz M, Duran GG, Eryılmaz N, and Jenedi K. (2014) Relationship between the resistance genes to quaternary ammonium compounds and antibiotic resistance in staphylococci isolated from surgical site infections. Medical Science Monitor. 2;20:544-50. April 2014.